46 • October 2014 • S I G N & D I G I T A L G R A P H I C S Digital Color Basics Color mechanics are key to understanding why what you see is not necessarily what you get Stephen Romaniello is an artist and educa- tor teaching digital art at Pima Community College in Tucson, Arizona, for over 20 years. He is a certified instructor in Adobe Photoshop and the author of several books on the creative use of digital graphics soware. Steve is the founder of GlobalEye systems, a company that offers training and con- sulting in digital graphics soware and creative imaging. B y S T e P H e N R o m A N I e L L o e Digital Eye DIGITAL PRINTING AND FINISHING DIGITAL GRAPHICS depending on how you plan to output the image. For example, three-channel RGB is used to display images on-screen, and four-channel CMYK is designed to organize the information into color separations for offset lithographic printing. Color Modes These systems are called color modes. The data is organized into color channels with specific characteris- tics. The appearance of an image is very much depen- dent on its color mode and the colors of the same image can look quite different from one mode to another. Zeros and Ones Remember, a computer is a giant calculator. It pro- cesses thousands of numbers in milliseconds. I'm sure you're familiar with our common decimal number system that uses 10 individual characters to express numerical values. Computers use only two charac- ters—a binary number system—where each unit (or bit) of information is assigned either a zero (0) or a one (1). Strings of these characters can produce any number from zero to infinity. In graphics it's helpful to think of these characters as on/off switches—zero is off and one is on. The number of on/off switches in each pixel is called the bit depth. As Simple as On/Off The easiest way to understand this system is to look at an image mode called bitmap, which is the simplest form of digital image. These single-channel images contain one bit of information per pixel—one switch that's either on, designated by the number 1 and displays as white; or off, designated by the num- ber 0 and displays black. Hence, a bitmap image is a mosaic of black and white pixels. 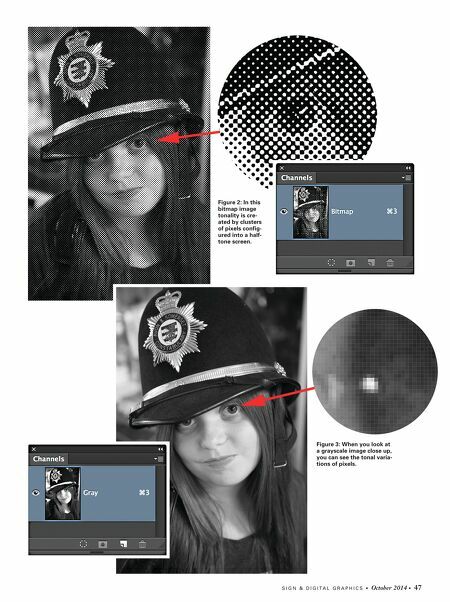 By clustering pix- els into halftone screens, tonality can be created (see Figure 2). If there are more black pixels (and halftone dots) clustered in a particular area, that region of the image will appear dark. Conversely more white pixels produce light areas. Grayscale Grayscale is what we traditionally think of as a black-and-white image. 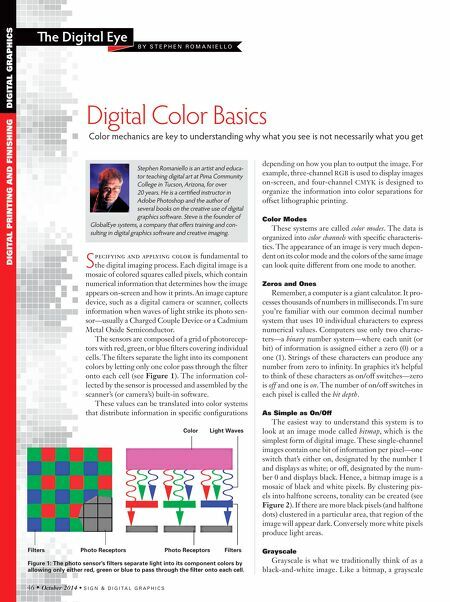 Like a bitmap, a grayscale S pecifying and applying color is fundamental to the digital imaging process. Each digital image is a mosaic of colored squares called pixels, which contain numerical information that determines how the image appears on-screen and how it prints. An image capture device, such as a digital camera or scanner, collects information when waves of light strike its photo sen- sor—usually a Charged Couple Device or a Cadmium Metal Oxide Semiconductor. The sensors are composed of a grid of photorecep- tors with red, green, or blue filters covering individual cells. The filters separate the light into its component colors by letting only one color pass through the filter onto each cell (see Figure 1). The information col- lected by the sensor is processed and assembled by the scanner's (or camera's) built-in software. These values can be translated into color systems that distribute information in specific configurations Filters Filters Photo Receptors Photo Receptors Color Light Waves Figure 1: The photo sensor's filters separate light into its component colors by allowing only either red, green or blue to pass through the filter onto each cell.